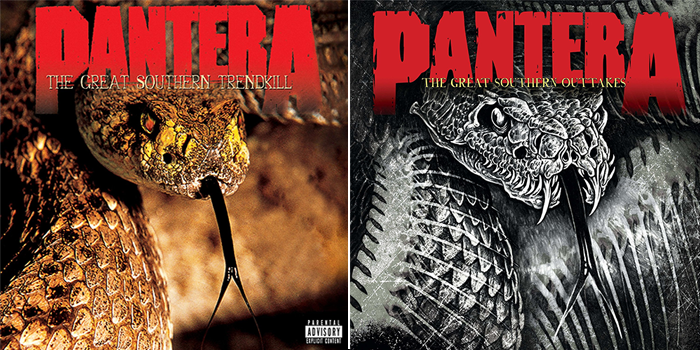 Pantera has announced The Great Southern Trendkill: 20th Anniversary Edition for October 21st via Rhino Records. The two disc set includes the original album remastered, plus a dozen previously unreleased mixes, instrumentals, and live recordings. The set also features rare photos from the era, as well as new liner notes by esteemed rock critic and radio producer Katherine Turman that explore the stories behind the album and its legacy. On the same day, a single LP titled The Great Southern Outtakes will also be available featuring ten of the unreleased tracks. Pantera pulled no punches on The Great Southern Trendkill, one of the most intense and hardest-hitting albums the group ever recorded; which is saying something. Released in 1996, the album reached #4 on the Billboard Top 200 chart, and went on to become Pantera’s fourth consecutive platinum release. After Pantera topped the album charts in 1994 with Far Beyond Driven, Philip Anselmo, Rex Brown, Dimebag Darrell, and Vinnie Paul returned two years later with the dark, unrelenting and highly personal music heard on The Great Southern Trendkill. The record stayed on the charts for more than three months and produced three singles: “Drag The Waters,” “Suicide Note Pt. 1,” and fan favorite “Floods,” a power ballad that includes an epic guitar solo that showcases Dimebag’s fretboard wizardry and is considered by many to be his finest. The companion disc that accompanies the original album features an unreleased version of every album track, including two versions of “Suicide Note Pt. 1” – a rough mix of the track, along with a separate version of the introduction, which spotlights Dimebag on 12-string acoustic guitar.